I love this soap! I use it every time I shower on my face, hair, and body. It works amazing as a shampoo before you Condition! It also clears up any breakouts I have on my face! It's like magic! I have this soap in every sink as a hand soap watered down by half. I also made a bottle of homemade soap from this. I really love how versatile it is. It can be used for laundry, body wash, home cleaning, and many others. I also love how simple ingradients come together. I dont love how strongly scented the lavender is, but it's great when watered down and combined with tea tree oil. I also think it can be a bit drying when used full strength, but again just water it down a bit first. Another great point is that it stretches really really far. Great Stuff! I like this part of the lot because it's really good for sensitive skin. One of the main times I like to use this is during winter time when my skin gets a lot more dryer because of the weather. This soap has a pleasant smell and the fact that it doesn't lather up or contain harsh ingredients is really good for my skin. My skin always feels supple and soft after using it. It's very concentrated so you only need a little bit and then you just dilute it with water. I also love the fact that it can be used for multiple uses. Love this multi use product! This soap is awesome for ANY cleaning. Body wash, pet shampoo, multi surface cleaner... I am a "brand buyer" in THIS case because I just love this brand specifically. I do think that is a great value! I love dr. bonner almond castile soap. It can be used for many things. It can be used for a bath or to wash your face. some people use it to make a household cleaner. I like to use for bathing or beauty rituals. I find It's a bit to drying for a shampoo at least for me. The best part about this product is that a little bit goes a long way! I'll buy a large bottle of this soap and am amazed each time how long it lasts!! Second best is the quality, smell, and effectiveness. It really cleans, squeaky clean and it's safe for the environment. I'm not the most forward conscious buyer but knowing my soaps that our entire family uses is in the right brings comfort. this is a great environmentally safe soap. it has been around for many decades and I proven safe for hundreds of use from bathing to cleaning house. pretty amazing really. you can replace all your hazardous cleaning and bath products with this one super concentrated bottle. Castile soap also comes in many scents or unscented so you can customize to your liking. It is a little pricey but a bottle will last you a very long time since a little goes a long way with this soap. I have this in my bathroom in the hand soap container. I bought it to use for my shower, but I find the scent is a little overwhelming. It is a good soap that can be used for a myriad of uses. It is a good bath soap, and can even be used as shampoo and face wash. It is best to use a conditioner after using castile soap as shampoo, because it will take all the product build-up out of your hair. It is also a good soap for hand-washing delicates, and it can be used in the washer, as well. Read the label, you will see all the uses they recommend! Effectiveness This is a very effective soap. It is made of all good ingredients and it gets everything clean and free of residue. 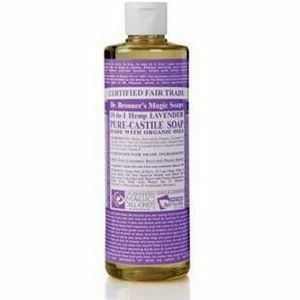 I use castile soap for all sorts of things in my house and I feel comfortable using it. Scent This particular scent, Lavender, is a bit too strong for my taste. But this soap comes in so many other scents, that you can really pick and choose as your mood dictates. I really enjoy the peppermint scent for my morning shower. It wakes me up and if I use it as shampoo, it makes my scalp tingle. I really enjoy it. I like the Lavender as hand soap in the bathroom, it doubles as air freshener when I wash my hands.